EPIRUS, THE IDEAL DESTINATION FOR INCENTIVES, CONFERENCES, CONGRESSES, MEETINGS, BUSINESS TRAVEL, INTERNATIONAL CULTURAL AND SPORT EVENTS. The region of Epirus, with its unmatched natural beauty and distinct cultural identity, lies on the northwestern corner of the Greek mainland. It extends from the peaks of the ever snow-capped Pindus mountain range to the shores of the sapphire Ionian Sea and is separated into four administrative districts: Ioanina, Thesprotia, Preveza and Arta. Ioannina, the capital of Epirus, enjoys a modern airport, with daily flights from Athens and three flights per week from Thessaloniki. There are also international flights to neighbouring Albania. 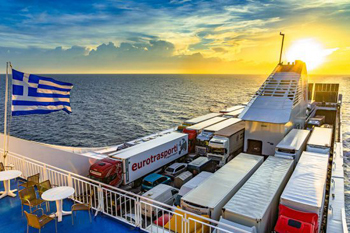 Modern buses offer frequent rides to all major cities of Epirus from Athens and Thessaloniki, while the town port of Igoumenitsa is connected via ferry with several Italian Adriatic cities, Corfu and the port of Patras. Life in Epirus has its origins well before the dawn of history. 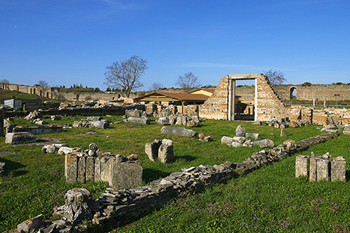 The region witnessed all the ups and downs of Ancient Greece, Rome, Byzantium and the modern era, gaining a uniquely individual sense of history and culture. The first Greek tribes that settled the area between the 19th and 15th century BC where the Thesproti, followed by the Molossi and the Chaones. In 800 BC the Corinthians founded colonies in the area, thus establishing frequent contacts between the Epirots and the culture of southern Greece. In the 5th century, Tharypas, the King of the Molossians, united the various clans of Epirus into a federation and endeavored to upgrade his kingdom culturally by inviting scholars and artists from southern Greece to his court. By the 4th century BC the kingdoms of Epirus and Macedonia had become close allies because of a royal marriage between Olympias, the niece of an Epirot King and Philip II of Macedonia. Their son was Alexander the Great. After a period of unrest, Pyrrus ascended to the throne of Epirus and in 280 BC decided to undertake what was to become one of the last Greek stands against the rising power of Rome. He mounted a campaign against the Romans, but following some impressive but exhausting victories he was defeated and returned to Epirus. Soon, the Romans subjugated Epirus and revenged Epirot resistance by utterly destroying seventy towns in the region. A couple of centuries later, most of the region’s habitants were forcibly settled at the town of Nikopolis, built by Octavian to celebrate his victory at Actium (31 BC) over the joint fleets of Antonio and Cleopatra. In 369 AD the Goths invaded Epirus, followed in 550 by great numbers of Slavs who settled the region. Various raiders plundered the area from time to time until it sought independence from the ailing Byzantine Empire in the 13th century. Then Michael Komninos founded the Despotate of Epirus with Arta as its capital, and in the whole region a favorable climate for the development of culture and sciences was established. In 1430 the Ottomans annexed the province and held it for almost 500 years. By the end of the 18th century the famous Ali Pasha became the ruler of Ioannina and expanded his sovereignty beyond Epirus to western Macedonia, Thessaly and much of the mainland Greece. At that time, this Pasha of Albanian origin felt strong enough to revolt against the Sultan, but he ended up assassinated on the small island of the lake of Ioannina in 1822. The region of Epirus was liberated by the Greek Army and was united with the Modern Greek State, in 1913. Ioannina is the capital and largest town of Epirus, standing on the western shore of Lake Pamvotis (or Ioannina Lake), which is the site of a picturesque island. The old quarter reflects the city’s role as a major commercial and intellectual center during the Ottoman rule. Within the city walls there are picturesque narrow lanes flanked by Turkish-styled buildings and two mosques. 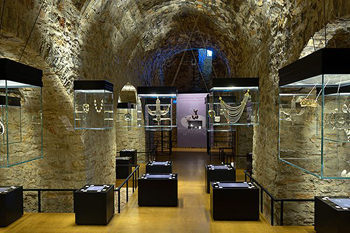 Attractions in greater region of Ioannina include the very important ancient oracle of Dodoni, with its colossal 3rd-century BC theatre, the acropolis, and the Sanctuary of Zeus. Further north lays the area of Zagorohoria, comprising 44 villages, offering some breathtaking views. An outstanding feature of the villages is the architecture, as the houses are built entirely of slate from the surrounding mountains – a perfect blending of nature and architecture. To the south stands Arta, the old capital of Epirus. 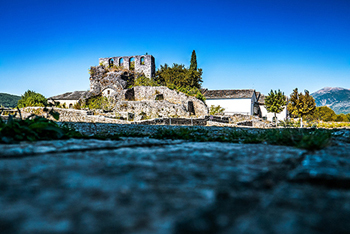 The town is mostly known for its famous stone bridge, the largest and oldest in Greece and for the numerous excellent Byzantine monuments in and around the town. 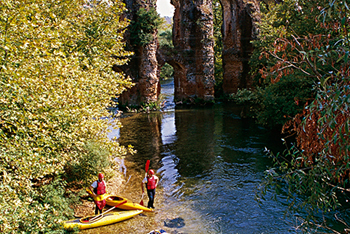 At the southernmost point of Epirus stands the picturesque town of Preveza with its three Venetian castles, old churches and a Venetian clock catching the visitor’s attention. In the same district one can see the Acherousia lake, the place where the ancient Greeks believed that stood the gate to Hades, the underworld. At the mouth of river Acheron, on the road to Hades, is still preserved the Necropolis and the Necromancy oracle. This was a place where the mortals went when they wanted to communicate with the souls of the deceased in order to learn about the future. Living the dead behind us, a very lively town awaits us nearby. 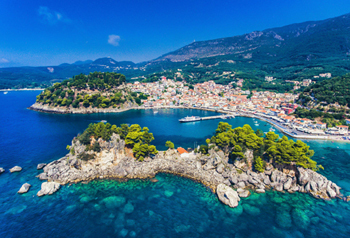 Parga is one of the most cosmopolitan vacation spots in Western Greece, but not without reason. Nature was more than generous with this location, decorating it with numerous small inlets, coves and islets surrounded by wooded hills. One cannot resist the temptation of an excursion by caique in the sapphire waters of this scenic landscape. Epirus is mostly a mountainous region, therefore its ideal for mountain climbing, skiing and other mountain related and winter sports. 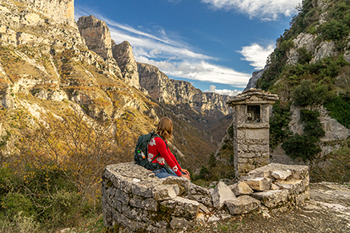 Ioannina is the best place to find organized treks in the fascinating Vikos gorge, as well as to many more remote areas of Epirus, deep in the Pindus mountain range. The Hellenic Skiing and Alpine Federation has set up refuge huts for mountaineers in the areas of Diasselo Astrakas at Mt. Pindus and at Vryssi Paliohori on Mt. Mitsikeli. In addition, on the Ioannina - Trikala national highway there is an excellent winter sports centre, barely two kilometres outside of Metsovo town. 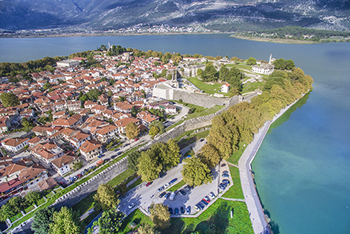 At the lake of Ioannina one can also enjoy some of the best water sports installations in Greece, hosting regularly major international athletic competitions. The town also offers a wide range of facilities for sports like tennis, football, volleyball, basketball etc. While in Epirus a visitor will have the chance to enjoy the local cuisine. The Eripotic pies are famous throughout Greece, prepared with artistry and traditional recipes by experienced cooks. We cannot omit the mastery of Epirots in baking various shorts of bread, in preparing roast and skewered meat, their local cheeses and of course the wines, which all fascinate the visitors. Epirots have a long established reputation of being masters in all forms of arts and crafts. Many villages have grown into noteworthy artistic centres with brisk activity in the establishments of goldsmiths and silversmiths, in gold embroidery, woven fabrics, woodcarving, etc. These traditional arts and crafts have carried through to the present day, especially at Ioannina and Metsovo, where several notable master craftsmen are to be seen in their workshops. Special purchases here may include gold and silver jewellery, metalwork, knitwear, and the famous “flokati” rugs. Whoever finds himself in Epirus on New Year’s Day will enjoy an old custom: in many regions the children visit the village houses holding a branch of a fir or cypress tree, decorated with fruit and colored pieces of paper. Some anthropologists believe that this custom goes back as far as the antiquity. 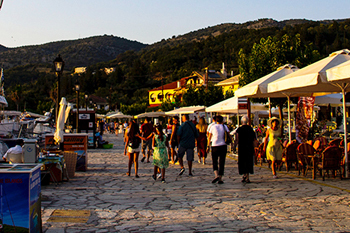 On various dates each summer, village fairs are held all over Epirus. A point is made on these occasions to revive and observe old customs, folk dances and folk songs, of which there is an extensive repertoire. The best-known celebration is that of Agia Paraskevi (26th July) which takes place at Metsovo. At this celebration, the inhabitants dance in their local traditional costumes. 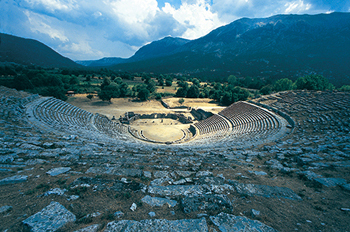 For those interested in ancient drama, there are the theatrical presentations during the Dodoni Festival, which takes place in the open - air ancient theatre of Dodoni. Greek drama performances are also held in Preveza during July. Finally, throughout July and August at Ioannina is held the Epirus Festival, presenting exhibitions of painting, popular art and literature as well as theatrical shows, concerts and dance performances by Greek and foreign troupes. The region’s seclusion by tall mountains has contributed to the natural negativity of people in Epirus to easily give up their good old habits, thus rescuing here many clues and facts of traditional lifestyle in mainland Greece. 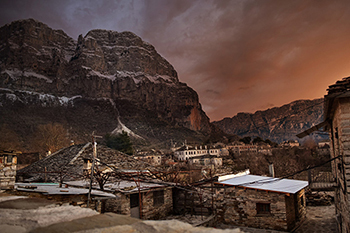 Several mountainous districts serve today as living museums; their little stone cobbled streets, traditional coffee shops and taverns, the craftsmen with their traditional art practices, untouched by any western influence and the old people still dressing with the traditional Greek kilt “foustanella”. These images intermingling with modern day activities contribute in creating in Epirus a relaxed sense of continuity, where time is not imposing on people but the opposite. This is centered in main towns and resorts with several bars and discotheques. Nightclubs featuring Greek music are extremely popular with both locals and the tourists. Bars, music clubs and cinemas at Ioannina and Arta are very busy with young people all year round, because of the large student communities that reside there. The atmosphere here is relaxed and the spirits are high. Trendy bars and clubs that carry on until early in the morning, offering a great variety of styles and music preferences, can be found also in Parga, Preveza and other smaller town and villages. 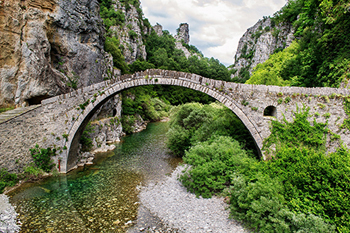 The Vikos - Aoos National Park north of Ioannina is of great ecological value, containing a huge variety of ecosystems. Amidst these superb mountains and forests live the last of the Greek bears, wolves, mountain lions, wild boars and otters. Wild goats and deer still browse on its precipitous cliffs, where eagles and vultures nest. 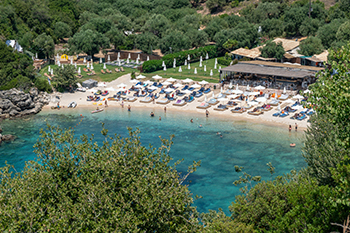 To the west stretches the Ionian Sea, a coast of a diverse blend of modern resorts, lagoons and river deltas, of which the latter two form an important system of wetlands. The so called double delta of the Louros and Arahthos rivers in the Amvrakian Gulf provides the conditions for the formation of a rare ecosystem of water -and salt- loving vegetation as well as a great diversity of birds and animals (herons, dolphins, sea turtles etc. ), many of which are endangered. The area is protected under the RAMSAR international convention. The Epirus region is pleasant alternative for conference organizers, especially if the focus is on holding meetings on a creativity-inspiring environment away from busy crowded tourist areas. The natural beauty of Epirus and its surroundings, along with the traditional architectural style of the towns and villages in the area is certainly a refreshing change. 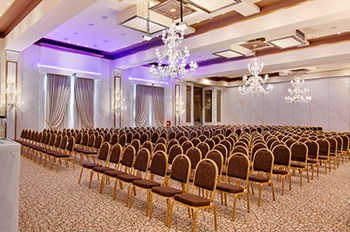 The technical infrastructure for conference holding is at its best here and it is being continuously modernised and upgraded, as Epirus is establishing itself at its natural position as a cultural bridge, connecting the European Community with the Balkans and the Orient.